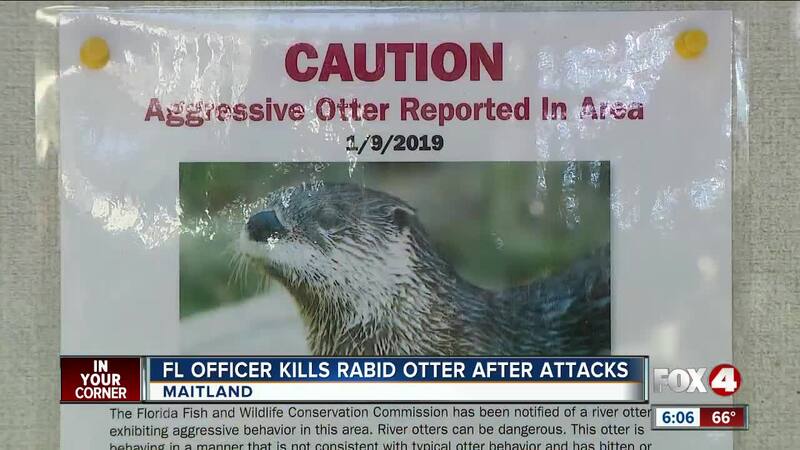 MAITLAND, Fla. (AP) - Authorities say a Florida police officer fatally shot a rabid otter several days after people reported attacks. Police say a visitor at a nearby park reported being attacked Jan. 7, followed by two more attacks the next day. Several days later, police responded to a home where someone reported a sick otter in their backyard. Officers say the animal appeared to be seizing and shaking. A report says the officer shot the otter twice, killing it. Orange County Animal Services confirmed the otter had rabies Saturday. Officials say the victims are undergoing post-exposure vaccinations. Rabies is a disease of the nervous system and can be fatal to warm-blooded animals and people.